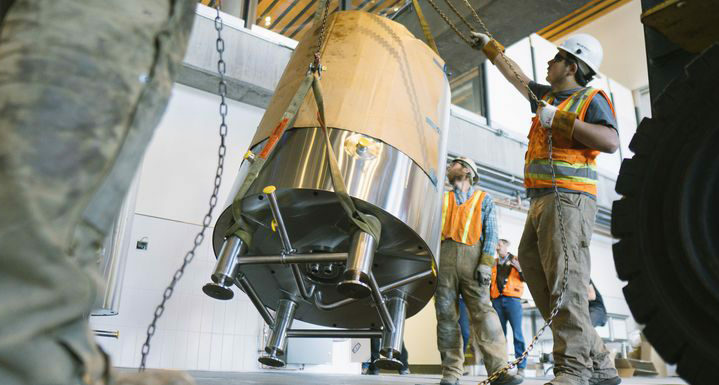 On the day of the installation, the team set up three semi trucks’ worth of equipment across the street from the brewery and started at 6 a.m. They shut down the sidewalk and part of the street, then used a fork truck to navigate the equipment through the garage door walls of the brewery. Every piece of equipment was in the space by 2 p.m. that afternoon. With the space set, New Belgium Pilot Brewery’s Head Brewer, Geoff Wenzel was free to go wild. To improve the experience for curious onlookers, the brewers brew on weekends to fill the hotel and its attached marketplace with the smells of brewing when the area is busiest. The brewery is like a test kitchen, giving brewers the ability to experiment and produce beers on a production schedule that the full-scale facility in Fort Collins couldn’t keep up with. That means leaning into any trend, like rye barrel ageing and wild yeast fermentation, that strikes the brewers’ fancy. And they now have the flexibility to go from idea to beer glass in just a few weeks.